Tales from a tribble: What Is Going On With The Rasmussen Reports Poll? Update: April 11, 2019: The extreme outlier status of the Rasmussen Reports poll on presidential approval rating continues. Note: For those of you who think I am pointing out this extreme outlier status by the Rasmussen poll is because Donald Trump is president and I just don't like Donald Trump, that would be wrong. I started this post thread with updates in October of 2013 [you can scroll down and find] when Barack Obama was president, and Rasmussen then was an extreme outlier of presidential approval in favor of Barack Obama-so, this is just a continuation, that if I didn't point out now because a Republican is president, I would be a hypocrite. There are 10 polling firms included. Without Rasmussen the range of approval rating for the president is between 39 and 46, with all but "the Hill" poll in the lower 40's. But Rasmussen not only has the approval rating in the upper 40's, they have it above water at 51%. And this isn't a one-offer, this is normal for the Rasmussen poll to be an extreme outlier - always in the president's favor, be it a Democrat or Republican president. It skews the entire RCP average by almost 1 full point, as the 9 polls without Rasmussen would have the president's approval at 42.3 as opposed to 43.2 with Rasmussen. From the beginning of this year [starting Jan. 3, because that's when Rasmussen began it's polling this year] until now, the highest number of presidential approval in Real Clear Politics has been 44.4% on March 3. Every other day this year the presidential approval was lower than 44% in Real Clear Politics. 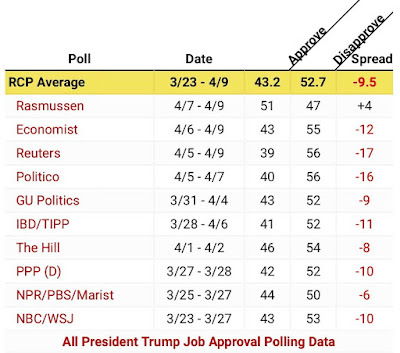 So, while the highest approval in RCP [and this was only on one day] was 44.4%, the average approval rating for the president in Rasmussen was 47.5% [Jan. 3 - April 11, 2019]. Also, in an amazing 17 times this year in Rasmussen the president's approval was at or above 50%. It was 0 times in RCP [and not even close]. Since Jan. 20, 2017 when Donald Trump became president, while RCP has never come close to having the president's approval rating [in their daily averages] at 50%, the Rasmussen poll has had Trump's approval 50% or better an incredible 83 times. So, if someone says, take the Rasmussen presidential approval poll with a grain of salt, that would be an understatement. Update: Jan.4, 2019: In my updated thread showing what an outlier, and in my opinion-bogus polling firm- the Rasmussen Reports poll has been since Scott Rasmussen left the firm in July of 2013 [check first post by scrolling below], I have always concentrated on the president's approval numbers. I never did do a statistical analysis of the generic ballot results of the Rasmussen poll. But I just noticed this when I was looking up something on Real Clear Politics that I hadn't noticed before. 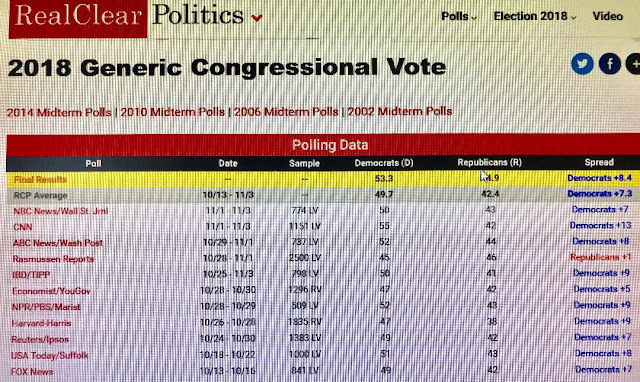 Check out these numbers of the generic polls, the very last ones just before the midterm election results came out, from the different polling firms and you can see what an extreme outlier Rasmussen is even in their generic poll. As you can see, every single poll in the Real Clear Politics average of polls for the generic ballot have the Democrats far ahead, with an RCP average of +7.3 for the Democrats. The final results were the Democrats +8.4%. Oh, every poll in the Real Clear Politics average except Rasmussen Reports, which incredibly had the Republicans up by one point in their final poll. Think what an extreme outlier that is. The Democrats won by 8.4% in the generic ballot but Rasmussen Reports actually had the GOP up in their final poll before the midterm elections. Oh, and if RCP had excluded the extreme outlier Rasmussen Reports poll from their final average, they would have had the Dems winning the generic ballot by 8.2% almost nailing the final results exactly! Update: Oct. 8, 2018: The following chart [below the Note] speaks for itself. How much can one poll skew the numbers? 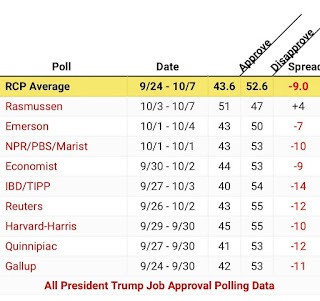 As you see with the Rasmussen Poll included in RCP's list of polls the approval spread of the president is -9%. Without the Rasmussen Poll included the numbers average would show an approval of 42.6% and disapproval of 53.2% for a spread of -10.6%. Update: Sept. 11, 2018: This from my conclusion update on Dec. 29, 2017: "While I can’t give a knowledgeable explanation why, for whatever reason, the Rasmussen Reports Poll just consistently gives a higher approval rating for the president, whoever is in office – whether it be Democrat or Republican. Therefore, they are not corrupt nor or they illegitimate. One just has to take that in account when someone quotes the Rasmussen Reports poll regarding the president’s approval rating. You must realize that is almost assuredly higher than what the other polls are showing, and also higher than the Real Clear Politics average of polls. In other words, take it with a grain of salt." As you can see, there are 8 polling firms RCP uses in their average and all but Rasmussen have the president's approval in the low 40's [4 polls] or in the upper 30% range [3 polls]. The one extreme outlier, as always, is Rasmussen which has the president's approval at 47%. So, to believe that the president's approval is anywhere near 50% you have to believe one polling firm is right [Rasmussen] and all the rest of the polling firms are wrong. To show how one poll, the Rasmussen Poll, can skew the Real Clear Politics average, with Rasmussen in the list of polls the president's approval average is 41% and disapproval is 53.5% for a spread of -12.5 %. Without Rasmussen in the list, what I like to call the Real Clearer Politics average would be: Approve 40.1%, Disapprove 53.9% for a spread of -13.8%. Update: April 5, 2018: From my update on Dec. 29, 2017: "I started this thread ... on Oct. 21, 2013 ... because I noticed that after the original founder of the Rasmussen Reports poll site, Scott Rasmussen, had left the web site to start his Rasmussen Media Group, LLC firm, there was an increasing outlier status of approval rating, positively for president Obama, in relation to all the other polls in the Real Clear Politics presidential approval rating poll." "My periodic updates of documented statistical analysis confirmed this consistent extreme [sometimes incredible] outlier status between the Rasmussen poll and every other poll that Real Clear Politics used in its average of polls. This wild extreme outlier status of Rasmussen, and always in one way – giving president Obama much higher approval ratings [and less negative ratings] than the Real Clear Politics average." What I have learned since President Trump became president, this extreme outlier status has continued, to the upside, for president Trump as it did for president Obama. So, after more than 4 years of statistical analysis of the Rasmussen Reports polling of presidential job approval numbers, I concluded definitively that, "for whatever reason, the Rasmussen Reports Poll just consistently gives a higher approval rating [many times in an extreme outlier status] for the president, whoever is in office – whether it be Democrat or Republican." That brings us to today. If you check out the Real Clear Politics presidential job approval polling for April 4, 2018, the average of polls contains polling numbers from 12 polling firms. Incredibly 11 of the 12 polls have the president in very negative territory [approval vs disapproval]. But the other poll [1 out of 12] has the president in positive territory by 3% points 51 - 48. Do I have to tell you which poll is the extreme outlier of the 12 polls? I didn't think so. 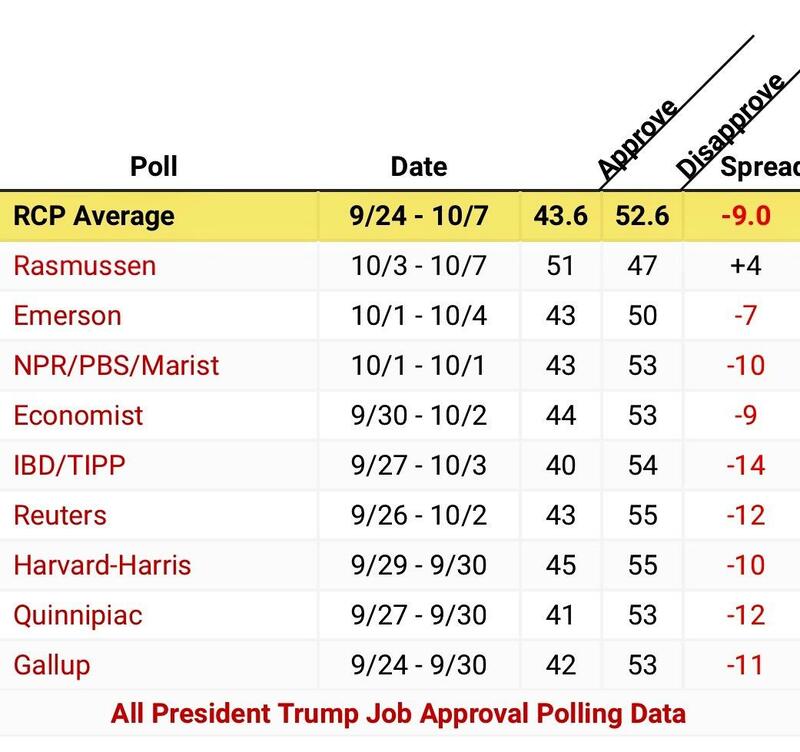 To show how much one poll [Rasmussen] can skew the Real Clear Politics average, with Rasmussen the RCP has the spread between approval vs. disapproval at -11.5%. If you took the 11 polls without Rasmussen it would be approval 41.0 vs disapproval at 53.7 = -12.7%. Update: Feb.26, 2018: I was going to make the last update on Dec. 29, 2017 my final updated post to conclude this now 4 1/2 year continuing post with a thread of updates, but decided to just show the latest RCP stats to show why one must take with skepticism the poll results from Rasmussen. This data speaks for itself. As you can see the approval vs. disapproval spread in RCP is - 13.0 ... in the 10 recent polls without Rasmussen the spread would be -14.3 [this shows how much one outlier poll can skew the rest of the average of polls]. I know many of you will say I am doing this because I was Never Trump during the election and don't want to give credit to a higher approval number by the Rasmussen poll-no, I am doing this to be intellectually honest as I began this post during the Obama presidency to show the wild outlier status of the Rasmussen poll giving president Obama much higher approval numbers than all the rest of the polls in Real Clear Politics. "Conclusion: While I can’t give a knowledgeable explanation why, for whatever reason, the Rasmussen Reports Poll just consistently gives a higher approval rating for the president, whoever is in office – whether it be Democrat or Republican. Therefore, they are not corrupt nor or they illegitimate. One just has to take that in account when someone quotes the Rasmussen Reports poll regarding the president’s approval rating. You must realize that is almost assuredly higher than what the other polls are showing, and also higher than the Real Clear Politics average of polls. In other words, take it with a grain of salt." Concluding UPDATE: Dec. 29, 2017: I started this thread [original post with constant updates] on Oct. 21, 2013, with my original post titled: “What is Going on With the Rasmussen Reports Poll?”. The reason I started it was because I noticed that after the original founder of the Rasmussen Reports poll site, Scott Rasmussen, had left the web site to start his Rasmussen Media Group, LLC firm, there was an increasing outlier status of approval rating, positively for president Obama, in relation to all the other polls in the Real Clear Politics presidential approval rating poll. Note: I hope you will scroll down to the original poll of Oct. 21, 2013 if you have never read this post before. My question was why did this happen? Was it just a coincidence that it was happening after Scott Rasmussen left the web site or had the methodology changed which gave this higher approval ratings for president Obama? And if the methodology did change, was it done purposely so [i.e., had some young liberals taken over the web site and the polling methodology to purposely show higher presidential approval numbers for the president]. My periodic updates of documented statistical analysis confirmed this consistent extreme [sometimes incredible] outlier status between the Rasmussen poll and every other poll that Real Clear Politics used in its average of polls. This wild extreme outlier status of Rasmussen, and always in one way – giving president Obama much higher approval ratings [and less negative ratings] than the Real Clear Politics average – continued into early 2015. Finally, with at least 3 straight months of Rasmussen being back in the mainstream with the other polls in Real Clear Politics [where they certainly weren’t in consistent extreme outlier status], on May 19, 2015, “Tales” [i.e., me] declared Rasmussen Reports poll back to legitimacy status, and that it looked like we could end the updates of the original, “What is Going on With the Rasmussen Reports Poll?”. But then I noticed something after president Trump took over the presidency. It seemed like Rasmussen Reports presidential approval poll was also becoming an outlier on the positive side [although not nearly as extreme as under president Obama] with the Real Clear Politics average, and I was opining in March of this year [check March 6, 2017 update] if I should put them back on the poll watch. What caught my eye today, Dec. 29, 2017, in Real Clear Politics was Rasmussen had president Trump’s approval up to 45% with only a negative 8% spread [approval v disapproval] at the same time Gallup’s poll came out today having Trump’s approval at 38% with a negative 19% spread, and the Real Clear Politics average was 39.3 % approval with a negative 17% spread. But, I must fairly note, that this is not extreme outlier status as there is another poll “Economist/You Gov” that has the president’s approval at 43%. But still Rasmussen Reports has the presidential approval rating higher than every other poll in the Real Clear Politics average of polls. So, what to make of all this? 1. What I got right from my original post, “What is Going on With the Rasmussen Reports Poll?”: The Tales original conclusion, in October of 2013, of an extreme outlier status by Rasmussen Reports poll to the upside of the president’s approval rating was confirmed. The higher [to the extreme side] approval rating during president Obama’s presidency, at least from October of 2013 until early in 2015 was clearly documented with statistical analysis. 2. What I got wrong from my original post: I assumed that this must be happening because of some purposeful methodology change to show president Obama with higher approval ratings because some liberals or Democrats must have taken over when Scott Rasmussen left the site. That almost assuredly didn’t happen because they [Rasmussen Reports] are still, for the most part, showing higher approval numbers for president Trump [although not wildly so, like under president Obama] than the Real Clear Politics average. In other words, Rasmussen Reports poll is not playing favorites as they have shown higher approval ratings for both president Obama and now president Trump. 3. Conclusion: While I can’t give a knowledgeable explanation why, for whatever reason, the Rasmussen Reports Poll just consistently gives a higher approval rating for the president, whoever is in office – whether it be Democrat or Republican. Therefore, they are not corrupt nor or they illegitimate. One just has to take that in account when someone quotes the Rasmussen Reports poll regarding the president’s approval rating. You must realize that is almost assuredly higher than what the other polls are showing, and also higher than the Real Clear Politics average of polls. In other words, take it with a grain of salt. UPDATE: March 6, 2017: Is it time to put the Rasmussen Reports poll back on the watch list? The Tales started a watch on the Rasmussen Reports polling of presidential approval rating back on Oct. 21, 2013 when we noticed some strange outlier status in their polling with regards to other polls in the Real Clear Politics average. Also, this outlier status seemed to begin after Scott Rasmussen, in July of 2013, left the Rasmussen Reports web site to found the Rasmussen Media Group, LLC-a digital media firm. So, that made us wonder if this was just a coincidence or if a new polling methodology was installed after Scott Rasmussen left the site he had formed. We gave detailed statistical updates showing the outlier status was not only consistent, but wildly out of the range of not just the RCP average of presidential approval rating, but also wildly out of range of every other poll in the RCP average [in that case, it was to President Obama’s approval ratings to the upside]. We finally ended the updates on May 19, 2015 as, with 3 straight months of getting back in the norm with the RCP average, we, in “The Tales” opinion, declared that the Rasmussen Reports Poll regained legitimacy status. Therefore, we ended the Rasmussen polls watch. Now the Tales is wondering if we should put the Rasmussen Poll [with regards to presidential approval rating] back on the watch list. This poll watch of the web site is nonpartisan as we started the watch in October of 2013 when they seemed to be an outlier to the upside with regards to President Obama’s approval ratings and now [in March of 2017] they seem to be an outlier with regards to President Trump’s approval ratings. There is not yet enough information in [as with regards to amount of time or number of polls] to determine if this is just a temporary anomaly or if this will become a pattern. 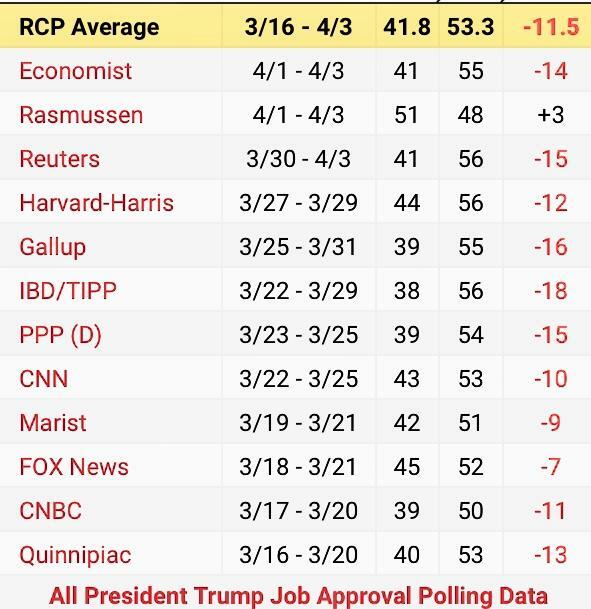 It took us many, many months of statistical data before we declared the Rasmussen Poll of presidential approval ratings [and those ratings only] as illegitimate [and we thought should have been taken off the list of polls listed in the RCP average of presidential polls]. Here is what we have found so far since president Trump took office on Jan. 20, 2017. Every single poll, from every polling firm listed in the Real Clear Politics average of polls has had president Trump’s approval rating under 50%-in every poll. Rasmussen Reports has had president Trump’s approval rating 50% and over in every single one of their polls since president Trump took office on Jan. 20, 2017. Rasmussen has had 31 polls since Donald Trump has been president [note: they do not poll on the weekends] and his average approval rating has been 53.1% in those 31 polls. His average disapproval rating has been 46.8%. Therefore, the Rasmussen Reports poll has had a 6.3% positive approval rating average since the beginning of president Trump’s presidency. This puts the Rasmussen poll a huge outlier in relation to the other polls and the Real Clear Politics average of polls, which in the same time period [RCP started their polling average of the president on Jan. 27, 2017] has never had the president’s approval in positive territory or even close to 50% during president Trump’s short stint as president so far. The Real Clear Politics average of the 38 polls from Jan. 27, 2017 until March 5, 2017 has had president Trump’s approval rating at 44.5% and disapproval rating at 48.9% for a negative rating of 4.5%. RCP average has never reached 47% approval one day since president Trump has taken office while the Rasmussen Reports poll has never had president Trump's approval below 50% since he has taken office. What do you think? With this extreme outlier status rearing its ugly head again with the Rasmussen Reports poll should Tales put it on the poll watch once again? May 19, 2015 [hopefully final] UPDATE: I think "Tales" [me] can finally and thankfully make this the last Rasmussen Reports polls update that we started in October 21, 2013. We began our Rasmussen Reports polls watch after Scott W. Rasmussen, the original founder of the Rasmussen Reports website, had left the firm to start a new media digital firm, Rasmussen Media Group, LLC in July of 2013. After he left the Rasmussen Reports, we noticed what had to be a change in polling methodology, as the Rasmussen presidential approval poll, from October of 2013 until February 22, 2015, became not just an outlier, but an extreme outlier [to the upside of the president's approval numbers] with regards to the RCP average of polls and all of the other polls in the Real Clear Politics list that they used to establish their average. 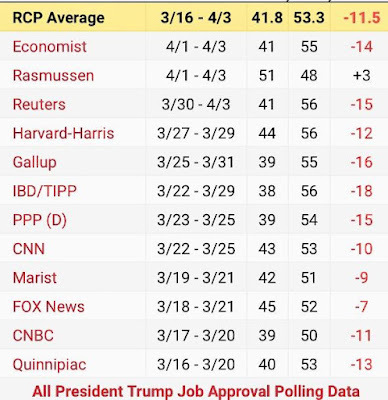 If you read my April 20, 2015 update, you will see that finally, beginning on February 23 this had changed and the Rasmussen Reports poll was right in line with the RCP average and was not an outlier at all. That has continued until today-almost 3 months now of Rasmussen not being an outlier [much less than an extreme outlier], so Tales officially announces that in our opinion, Rasmussen Reports is back to legitimacy! When Rasmussen Reports, for those 16 months when they were an extreme outlier, they averaged over 4 times a month of the president's approval at or above 50% [55 times between Jan 15, 2014 and Feb. 22, 2015]. RCP's average never reached [or was even close to reaching] the 50% mark for the president's approval, much less over 50%, as Rasmussen had so many times. Since Feb. 23 of this year [almost 3 months now] they have had the president's approval up to 50% only one time. Also, the Rasmussen Reports spread [approval vs disapproval] of the president's approval numbers these last 3 months has been right in line with the RCP average of polls spread. It is no longer an extreme outlier to the upside of the president's approval. As we speculated in our April 20, 2015 update, we think the fact that Rasmussen no longer polls on the weekend [on their presidential approval number] has helped bring Rasmussen Reports polls back to legitimacy. Whatever the reason, welcome back Rasmussen Reports polls as one of the polls to watch. April 20, 2015: On the last update, about a month ago, Tales asked if we should take Rasmussen off the bogus poll watch. Now I think with almost two months of positive data in, the answer is yes. We put the Rasmussen Reports poll on a bogus poll watch, because for 16 + months the poll had become an extreme outlier with regards to the Real Clear Politics average of polls [and with regards to all of the other polls in the list]. This extreme outlier status was noticed by the first post of this blog on Oct. 21, 2013 and we noticed that this was the time after Scott Rasmussen had left the Rasmussen Reports firm to start a new media digital firm, Rasmussen Media Group, LLC in July of 2013. If we are correct in assessing they are returning in good standing with other legitimate polling firms, we believe than that this bogus status lasted until Feb. 22 of this year. Since Feb. 23, 2015 until today the Real Clear Politics poll of polls has far the most part been between 45-46% [except for a couple of days] and the Rasmussen Reports poll has been between 46-48% [except for a couple of days]. So, that is not really an outlier at all, much less an extreme outlier, especially when you consider the very respected Gallup poll has been very close to Rasmussen [if not over on some days] with the presidents approval numbers. Also, when Rasmussen Reports for those 16 months was an extreme outlier, they averaged over 4 times a month of the president's approval at or above 50% [55 times between Jan 15, 2014 and Feb. 22, 2015], Since Feb. 23 of this year [almost two months] they have had the president's approval up to 50% only one time. Also, and even more telling, we have checked the data of the spread [i.e., the president's approval vs. disapproval numbers] for each of the last 30 days. Note: we rounded off the RCP spread to the nearest 1%. We looked at the data beginning on March 21, 2015 when RCP had the president's spread at a negative 6% until today April 20, 2015 where RCP has the spread at negative 5%, and in all but two days, the Rasmussen spread has been very close, within a couple of points of the RCP spread, certainly no outlier. Only on March 23, when RCP had a negative 6% spread vs. Rasmussen's negative 2% and on April 14 when RCP had a negative 5% spread and Rasmussen had it even [49 -49] could the Rasmussen poll be considered an outlier. So, Rasmussen has been close to the RCP averages for almost two months now and certainly not an extreme outlier like they clearly had been for all of 2014. One thing that I believe has helped the Rasmussen numbers is that they no longer poll on weekends, and those weekend days seemed to be their most wild outlier days in 2014. Whatever the reason, Tales, being fair and balanced, recognizes the Rasmussen Reports poll has come back into the realm of legitimacy. This also shows that while we were begging RCP to take them out of their list of polls, they probably were wise to leave them in their list. Another reason why, Real Clear Politics is number one as the poll to turn to. March 26, 2015: Can we now take Rasmussen off the bogus poll watching list? For over 16+ months this post has been dedicated to monitoring the extreme outlier status of the Rasmussen Reports Poll, a status that all has taken place since the original CEO of the web site, Scott Rasmussen, left the site to start a new media digital firm, Rasmussen Media Group, LLC. There wasn't just an every now and then outlier status, but a continuous extreme to the upside of the president's approval number status by Rasmussen in relation to all the other polls in the great Real Clear Politics poll of polls. But for the last month we have noticed that Rasmussen has not been way out of line with the other polls in RCP, especially with its spread of approval vs disapproval. One of the main reasons this is true is because for the first time in over a year and a half, there were some other polls, like Gallup that have actually matched Rasmussen's high approval numbers for the president. Since Feb. 23, 2015 until today, March 26, 2015, Rasmussen has had the president's approval only reaching 50% one time on March 11, 2015-and the only day in that period that they showed a positive spread for the president's approval. The spread in RCP since Feb. 23 has been between negative 4.7 to negative 7.7 and while Rasmussen some days had a less negative spread, for the most part they were not an extreme outlier like they had been for so long and many days have been right in line with the RCP spread. For example, today Rasmussen has the president's approval at 46% with a negative 8% spread. Real Clear Politics has the president's approval at 44.9% with a negative 6.6% spread. So, Rasmussen actually shows a higher negative spread than the RCP average. Update: Feb. 1, 2015: Hat tip to my faithful reader of the Tales, Scott, for alerting me of this update. It is true since the beginning of the year, and especially after the State of the Union address president Barack Obama's approval ratings have risen in the RCP averages. For the first time in a very long time the president's approval has reached 45% [on January 21, 2015] and up to a high of 46% [on Feb. 1, 2015]. The president's approval for the entire year of 2014 never once reached as high as 45%. With that being said, the Rasmussen Reports poll has managed to still find itself an outlier to the upside of the presidents approval rating. Today, Feb. 1, 2015 the Rasmussen Reports has an approval for the president of 51% and disapproval of 47% for a +4% spread vs. the RCP average spread of -2.9% [skewed up by including Rasmussen]. But more telling how Rasmussen has not changed their outlier status ways in relation to the Real Clear Politics average of all the polls is the number of times Rasmussen has had the president's approval at or above 50% in January. The readings for January of this month began on Jan. 3, so there were 29 days of readings in January with Rasmussen having the presidents approval at 50% or above 13 of those 29 days. That is an average of 44% of the time they have had the president's approval that high. On the other hand, the Real Clear Politics average has had the president's approval at or above 50%, 0 times-nada-none. For the benefit of Pittsburgh Steeler fans that is 0%. In fact the last time the Real Clear Politics average of polls has had the president's approval up to 50% was on March 5, 2013-an incredible 23 months ago. While you can read the previous update posts on this article how many numerous times the Rasmussen Reports has had the president's approval at or above 50% [and then include today's update showing that they have amazingly had the approval's rate at or above 50% 44% of the time this year]. The outlier to the upside of the president's approval rate continues yet another year in the questionable Rasmussen Reports polling since the departure of the great Scott W. Rasmussen in July of 2013. With that many months of data to back up their change of being a wild outlier to the upside of the president's approval rating with regards to the RCP averages, am I out of line to think there has been a purposeful methodology change by the new owners of the Rasmussen Reports poll website to skew the results in that direction? Update: December 8, 2014: I'd like to ask this question to who I believe are the true polling experts and professionals who work at Real Clear Politics. Your great average of polls, who I think everyone goes to, to find out the pulse of the nation on different issues and on the president's popularity, has had the president's approval rating below 45% for the entire year, 2014 [and that average even included the outlier Rasmussen poll which skewed the result, that would have made the president's approval number even lower without this poll included]. Don't you think, as I do, that this low presidential approval number was the true indicator that predicted the GOP wave that was about to happen in November-and not the individual polls of candidates? If you do agree with that, then look at the Rasmussen Reports presidential approval numbers from the year 2014 which had the president's approval in the upper forty's for almost the entire year-many times at or above 50%. Don't you believe RCP, as I do, that if the Rasmussen Reports Polling was anywhere near accurate, there is no way that the GOP wave could have happened. In fact, if Rasmussen was accurate, and not bogus like the Tales has surmised, then the Republicans not only wouldn't have had the big wave they had in November, they wouldn't have even come close to winning the senate or winning as many house seats as they did or winning a net two more Governorships. It wouldn't have happened. I think you must admit that the 2014 midterm elections verifies the bogus nature of the Rasmussen Reports poll, at least in regards to presidential approval numbers. Today, Monday December 8, 2014, the Rasmussen Reports actually is trying to say that the president is back above water with 50% of the nation approving his job performance and 49% disapproving. Maybe it is the president's considering sanctions on Israel that accounts for this leap in his approval, according to Rasmussen. Sheesh! I am asking you RCP if you will consider taking Rasmussen out of your list of polls, at least in the list of presidential approval numbers. Their accuracy and legitimacy has been totally shot by the midterm election results. I am not asking you to remove Rasmussen from your polling list as it regards to individual races or generic congressional numbers or on any other list. They may be useful in those lists. But to continue to include the Rasmussen Reports poll, that has skewed your excellent RCP average, does not seem right when evidenced from more than a year of wild outlier status since Scott W Rasmussen left the firm. Check out these unbelievable statistics for the year 2014. There have been 336 polling days [that does not include holiday periods] so far for the year 2014. In those 336 polls, the Real Clear Politics average of polls [even including Rasmussen] has not one time had the president's approval reach 45%. So,the Real Clear Politics average for the entire year has had the president's approval between 40% and below 45%. Rasmussen, on the other hand, has had the president's approval below 45% these 336 days a total of 8 times. That equals 2% of the time Rasmussen has had the president's approval below 45% vs. 100% of the time for RCP. To put it another way, the Rasmussen Reports Poll has had the president's approval between 45-52%, 98% of the year vs. 0% for RCP. Included in this ridiculous polling data by Rasmussen is, that they now have had [with Monday's poll] the president's approval at or above 50% an incredible 33 times in the year 2014. As the great Hugh Hewitt would say, and if you believe the Rasmussen numbers are legitimate, you are either a Pittsburgh Steelers fan or he has a bridge he want to sell you. So, I will positively say keep up the great work Real Clear Politics and consider this post with regards to having Rasmussen listed in your presidential approval numbers. Thank you for your consideration! Update: November 12, 2014: Post Election Update: I could have also entitled this update, " Election Results Prove The Dubious Legitimacy Of The Rasmussen Reports [post Scott W. Rasmussen]"
As you can see, only in the Colorado race did the Rasmussen Reports favor the GOP candidate to the upside, while in every other race they underestimated the GOP margin by huge margins to the downside. But even without these numbers, I believe the election results proved the bogus nature of the Rasmussen Reports since Scott W Rasmussen left as head of the web site in July of 2013. Rasmussen Reports, as you can scroll down to look at my previous update posts on them, has had the president's approval numbers in the upper 40% [and over 50% at times] since I began this Rasmussen Reports poll watch on October 21, 2013. In this year 2014 I have documented that over 97% of the time Rasmussen has had the president's approval over 45%, most of the time in the upper 40% range, while at the same time the RCP average of all polls have never reached 45% one time. So, the election results, in my opinion, were either going to prove that the Rasmussen Reports poll was correct and all the other polls were wrong or vice versa. If the president's approval was actually in the upper 40% range for almost the entire year of the election, there is no way the tsunami wave would have occurred for the Republicans. I have heard many pundits say that the president's approval numbers in a midterm election are crucial to how his party will do in that election. The election proved that the RCP average of polls [which even included Rasmussen that skewed the numbers-or they would have been worse for the president] which had the president's approval in the lower 40s for almost the entire year were correct! That foretold how bad this election was going to be for the Democrats, and it was proven to be right and Rasmussen wrong. Even today, Wednesday Nov. 12, 2014 the Rasmussen Reports has the president's approval up to 47% [he had it up to 48% the previous two days], again as always an extreme outlier with the rest of the polls in the RCP average. Maybe it was the Obamacare official who called the American people stupid the explanation why Rasmussen once again has Obama's approval near 50%. Or maybe the Rasmussen Reports is totally unreliable, to say it kindly. Tales reports, you decide. Whatever the reason, the Tales is still watching you Rasmussen Reports. Update: Oct. 21, 2014: I started this post exactly one year to the day on Oct. 21, 2013. Little did I realize that I would still be giving updates a year later and that this post would become the most viewed, by far, of any post published by the Tales. When I first published this post, "What is going on with the Rasmussen Reports Polls? ", one year ago, I was curious but making no accusations, about the strange polling results of the website after the departure of the website's founder, Scott W. Rasmussen. I really was wondering who took over the poll from Scott and if they had a liberal political agenda because the Rasmussen Reports poll almost immediately became an extreme outlier, to the upside, of the president's approval rating-and it became like that all the time! Check these amazing stats out: In this year 2014 until today, there have been 292 polls released by the Rasmussen Reports website [missing some Holiday days] of the presidential approval numbers. Out of those 292 times, only 8 times has the Rasmussen Reports had the president's approval below 45%. That means that 284 out of 292 days the Rasmussen Reports presidential approval numbers between 45-52%. That is an incredible 97.3% of the time. The reason I say incredible, is because the great Real Clear Politics average of presidential approval numbers during this entire year has had the president's approval at or above 45%, like Rasmussen, 0 times. Let me be clear on that. RCP has had the president's approval rating reaching 45% or above zero times, nothing, nada. For the benefit of Pittsburgh Steeler fans, that is 0%. Let me repeat: Rasmussen presidential approval numbers for 2014 have had president Obama's approval numbers above 45%, 97.3% of the time vs. 0% of the time for Real Clear Politics. As you can see in the RCP graph above, the president's approval numbers in 2014 have never reached the 45% mark, as opposed to the Rasmussen Reports polls which have had the president's approval numbers between 45-52% for 97.3% of the time during this exact same time period. Also, as bad a year everyone acknowledges that president Obama has had [and more importantly the nation, I might add], the Rasmussen Reports has actually had his approval ratings between 50 and 52% for 32 times this year. That is mind boggling to me. Yes, one year and this post is still going strong, and the Rasmussen Reports continues its wild, extreme outlier status in regards to the Real Clear Politics average of polls. After one year of unbelievable polling coming out of the Rasmussen Reports web site [I must state again-since the departure of Scott W Rasmussen], I consider their polling, at least as it relates to the presidential approval numbers to be bogus. You may not. Tales reports and you decide. Update: Oct. 14, 2014: If any neutral observer just looked at the headlines over the last few weeks they would realize that things seem like they are almost spinning out of control [with ISIS, economy, downturn in the stock market, Ebola, etc.]. With all of that bad news and the fact that the commander-in-chief certainly seems to not be leading or at least it can be said he is leading badly, you would think that the president's disapproval numbers would be very high and his approval rating would be low. And for almost every poll in the Real Clear Politics average that is true. Every poll that is except Rasmussen who today, Tuesday, Oct. 14, 2014 has the president's approval rating leaping up to 49% with a disapproval rating of 49%. So, according to the Rasmussen Reports poll, Obama is back to even water. What? Are you kidding me. Is there anyone out there, even liberals, who actually believe there is a 0 spread between Obama's approval and disapproval numbers? Without the Rasmussen Reports numbers in the Real Clear Politics average, the president's approval rating among all the other polls is 41.7% and the disapproval rating of all the other polls is 52.5%. So, that means, sans Rasmussen, there is an RCP avg spread of negative 10.8 % vs. a 0 approval/disapproval spread from Rasmussen Reports. And if you still believe the Rasmussen Reports Polls are legitimate, I have a bridge I want to sell you. Update: Oct. 6, 2014: When I had started this Rasmussen Reports poll watch on Oct 21, 2013 [that you can see by scrolling down], little did I know that almost one year later I would still be doing updates of the Rasmussen Reports polls [re: the president's approval rating], as it has continued to show a definite outlier status [and an extreme outlier status except for a brief period between July and August] all this time. Think about that, an outlier status for almost a year, all to the upside of the president's approval numbers. This extreme unrealistic outlier status for such a prolonged period has happened since [and almost immediately after] Scott Rasmussen left the Rasmussen Reports web site to start a new company in July of 2013, Rasmussen Media Group, LLC, a digital media firm. Now lets compare that to the Rasmussen Reports presidential approval numbers for this entire year. From their web site, the president has been below 45% this entire year, 8 days. Yes, I said 8 days out of 277 days which means that the Rasmussen Reports has had the president's approval at or above 45% [between 45-52%] for 269 out of 277 days, which equals 97.1% of the time. For the benefit of Dallas Cowboy fans let me repeat those numbers. The Rasmussen Reports poll has had president Obama's approval rating for the year 2014 at or above 45% for 97.1% of the time, while the Real Clear Politics average of all polls [even including Rasmussen] has had the president's approval rating at or above 45%, 0% of the time. The reason I keep saying that the Real Clear Politics average contains the Rasmussen Reports Poll in their average, because the president's approval rating would be even lower for the entire year if it did not have the Rasmussen outlier poll skewing it's average. As I have stated since the beginning, Tales will continue to watch you Rasmussen Reports and we will report and let the people decide on your legitimacy since Scott Rasmussen left the firm. Update: Sept. 22, 2014: I got into a discussion with someone on twitter questioning why I was complaining about the Rasmussen Reports now, since they have always been a dubious polling firm and they were just as bad when Scott Rasmussen was there as they are now. I doubted that but was curious to look at the numbers to see if that was true. Please read my analysis in this post I published on another page: "Analysis of The Rasmussen Reports Before And After Scott Rasmussen's Departure". Thank you! Update: Sept. 14, 2014: I think there should be another billboard up with Scott Rasmussen's picture to echo the one you may have seen showing a picture of George W. Bush saying, "do you miss me now?" The Rasmussen Reports web site just hasn't been the same [and that may be the understatement of all time] since July of 2013, when Scott left it to found his digital media firm, "Media Group, LLC". The ridiculous extreme outlier position compared to all the other polls listed in the great Real Clear Politics web site continues for Rasmussen as on Sunday they actually have Obama's approval rating almost back to level with a 49% approval vs. 50% disapproval. Are you kidding me Rasmussen Reports? Real Clear Politics has 8 other polls listed in it's average and every single poll out there has Obama's approval in the lower 40's to high 30's. The highly respected Gallup poll during the exact same time period Rasmussen does has it's last poll listed [9/11-9/13] has Obama's approval at 41% and disapproval at 54%. That is a negative 13% spread vs. Rasmussen's negative 1%. They both can't be accurate-so, which one do you believe? Update: Sept. 12, 2014: Well, throw out my optimism [out of hope] that the Rasmussen Reports website has come back to reality in their polling methods. If they did finally make a slight adjustment in their polling methods for July and August [like I thought], where they weren't an extreme outlier, like they had been the previous 6 months, that seems to be out the window now with their September numbers. It's like back to the future, or Deja Vu all over again with Rasmussen's numbers this month. They are definitely returning to their extreme outlier [in epic proportions] position in relation to all the other polls listed in the great Real Clear Politics web site. Let me list the following numbers and you see if you can see which number seems out of place. [I will give you a big hint by highlighting it. :-)]: 40, 42, 38, 40, 43, 38, 41, 48 The poll numbers of presidential approval listed, in order were, Gallup ABC News/Washington Post, Fox News, CNN Opinion, Reuters, Economist/ You Gov and drum roll please- Rasmussen. The Real Clear Politics average spread of every poll of presidential approval vs disapproval numbers including Rasmussen is a negative 13.3%. Rasmussen's spread, only a negative 3%. All I can conclude is, this is disappointing Rasmussen Reports....very disappointing as you seem to be moving back into bogus territory. As, usual Tales will be on the watch. Update: Sept. 4, 2014: If you have noticed my last few updates of the Rasmussen Reports poll watch, you have seen that I have been encouraged that Rasmussen was coming back into legitimacy with what has surely been a change in polling methodology for the last 2 months. I have been trying to give them the benefit of the doubt and I also wanted to make sure that the Tales remains a fair and balanced blog. They certainly hadn't been a huge unrealistic outlier like they had been the previous 6 months. That is until today. So, with some readers urging, I must do this update. The last two days, with president Obama's rankings falling even farther in the great Real Clear Politics average, they have gone up in approval in Rasmussen to 46% yesterday and 47% today, with only a negative spread of 4%. What positive presidential action or good news report could have caused this jump? While Rasmussen has president Obama's approval jumping to 47%, Gallup [in the same exact polling period timeline] has had the president's approval drop to 39% yesterday and 38% today-with a negative spread of 16%. How is this possible? And it is not just Gallup. 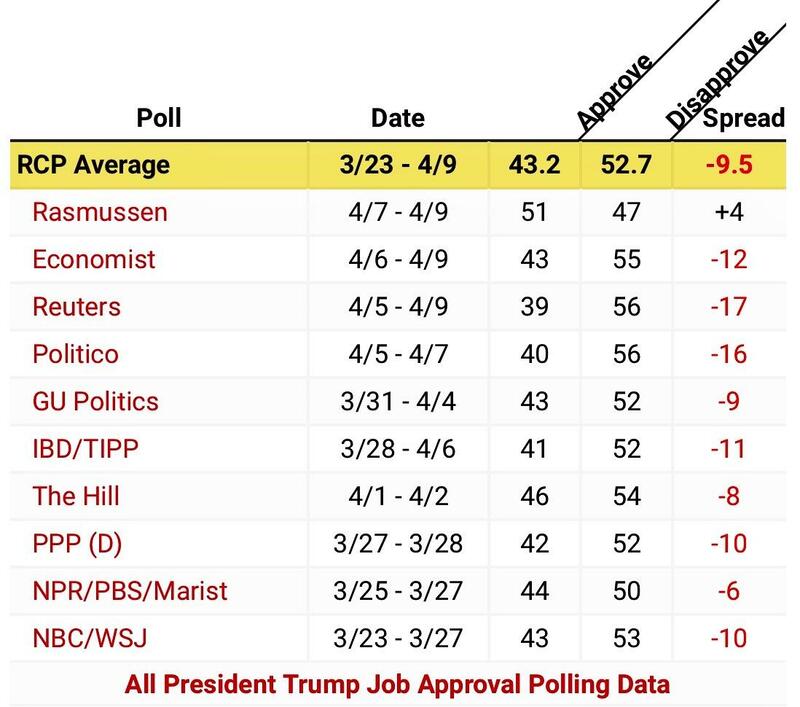 The 5 polls listed in the Real Clear Politics average, not counting Rasmussen have the president's approval rating down to one of it's lowest ratings in his presidency. But not Rasmussen. I am hoping these last two days have been an anomaly for Rasmussen and they are not returning to their ridiculous huge outlier status compared to the other polls in RCP. Update: August 22, 2014: While the Rasmussen Reports presidential poll has still been an outlier to the plus regarding the president's approval numbers, they have not been an extreme outlier [like they had been] for almost 2 months now. It was June 30, 2014 the last time Rasmussen has had Obama's approval up to 49% or greater, like the many times they did the previous 6+ months. Now instead of their positive to negative approval ratings being 8-12+ points greater than the Real Clear Politics average almost every day since I began this Rasmussen poll watch on October 21, 2013, they have come down to within about [only] 3-5 points higher since the beginning of July. That is within reason. I submit, they must have made an adjustment to their polling methodology that has brought them within shouting distance of all the other polls out there. Yes, they are still showing slightly higher approval numbers for president Obama, but their results have become more realistic compared with the other polls in RCP. For example, today the Rasmussen Reports has Obama's approval at 45% compared to the RCP average of 42% and their spread of negative 8% compares favorably to the RCP average of negative 10%. Note-update: On Sunday, August 24, the Rasmussen Reports has president Obama's approval down to 43% and the spread is negative 13%. Not an outlier at all. Along with the last 7 weeks in polling, this convinces me that the Rasmussen Reports poll website has definitely made an adjustment in their methodolgy of polling and they can once again be included in the family of legitimate pollsters. Therefore, I must confess that RCP has shown more wisdom in keeping them in their list of polls and not taking them out like I have suggested many times. I apologize, RCP, you were right. Update: July 26, 2014: For the the first time since I have started this Rasmussen Reports poll watch 9 months ago, I may be detecting an adjustment in the Rasmussen Reports polling methodology, an adjustment that has inched them closer to legitimacy in the last 24 days. Yes, they still [until today] have been a slight outlier to the upside compared to the other polls in the great Real Clear Politics list of polls, but they have not been outrageously so, as they have been since the beginning of this poll watch. Today, Saturday July 26, 2014 they are not an outlier at all as they have Obama's approval down to 44% and disapproval at 54% for a - 10% spread. The RCP average today [before Gallup new numbers on Saturday] is 41.7% approval with a negative 11.7% spread. So, Rasmussen is close to the RCP average and I would say for today at least, not an outlier. The last time Rasmussen has had the president's approval down to 44% was on February 13, 2014. Even more telling that there might have been an adjustment made for the better regarding the Rasmussen Reports polling methodology is that for almost 4 weeks Rasmussen Reports has had Obama's approval up to 48% only twice and they have not had his approval above 48% since June 30, 2014. The last time Rasmussen Reports has had Obama's approval up to 50% was on June 9, 2014. Update: July 14, 2014: To be fair and balanced on this Rasmussen Reports watch, I must report that for the longest stretch this year 2014, the Rasmussen Reports has not been an extreme outlier. Yes, they have still been an outlier to the upside of the president's approval rating but not wildly so [for almost 2 weeks]. For the last 9 readings Rasmussen has had Obama's approval rating at 45 or 46%. The last time Obama's approval was 47% or higher in the Rasmussen Reports was on July 2. While the Rasmussen approval of the president is still 5% higher than the RCP average, and their spread of approval vs disapproval is still 5% more positive for the president, at least they are within shouting range. We will see if this trend continues, which might mean Rasmussen has adjusted their methodology so as not to be such a huge, irrational outlier with respect to the other polls, or if this is a temporary anomaly. You can be sure, Tales will be on the watch. Update: June 30, 2014: Well, that didn't take long. In the last Rasmussen Reports update Tales reported that for 3 straight days Rasmussen had Obama's job approval at 45% and its negative rating of -8 and -9%, which for those 3 days meant it was not a huge outlier like it has been for 8 months [since Scott Rasmussen left the polling firm]. Now just 5 days later with certainly no positive news coming out on the president's behalf, in fact, much negative news having occurred, Rasmussen amazingly has Obama's job approval leaping back up to 49% with a disapproval of only 50%. We didn't even get one week of reasonable poll numbers out of Rasmussen [compared to every single other poll listed in the great Real Clear Politics]. Let's put this in perspective. The Real Clear Politics average of every poll listed without Rasmussen has Obama's approval at 40.7% and a disapproval of 54.1% which equals to a negative 13.4% rating. Rasmussen has Obama's approval at 49% and a negative 1% rating. Would you consider that an outlier, or, after 8 straight months of similar results, evidence of a bogus polling firm? Tales reports, you decide. Update: June 25, 2014: In what I hope is not an anomaly for the Rasmussen Reports, but it probably is, for the first time in 38 days [and for one of the very few times in the last 8 months] the Rasmussen Reports does not have president Obama's approval rating above 45%. It is exactly 45% approval vs 54% disapproval. That negative 9% rating from the Rasmussen Reports is the first time it has been this low on their web sight in 72 days, on April 14, 2014. In the past whenever, every once in a while, Rasmussen Reports has had a reasonable polling result, at least not an extreme outlier, it is quickly followed in a couple of days back to their extreme, outrageous outlier status. We shall be on the watch. One thing I think this number today points out, that the president must really be in bad shape, polling wise, if even Rasmussen has them at negative 9% and not in the upper 40's. I guess that could be one of the arguments Real Clear Politics might give for not dropping them yet [like we have called for], so then a number like today highlights even more clearly the president's problems. Update of update: today it is Friday June 27, 2014 and for the third straight day Rasmussen has had Obama's approval number at 45% with a negative 8% approval vs disapproval rating. These last 3 days of not being extreme outlier results do not erase 8 months of incredulous poll numbers by the Rasmussen Reports - so, Tales will remain vigilant. "So today you have Obama's approval/disapproval at 49/50; a minus 1 in net disapproval. The Real Clear Politics average is minus 12 in net disapproval. Your national polling is pathetic. Your national polling has been a Daily Outlier since Scott Rasmussen departed. Good e-mail to Rasmussen Reports, Scott. Thanks, for sharing. Updating stats on Sunday June 22, 2014: for the last 244 days [since Oct. 21, 2013] the Rasmussen Reports has had president Obama's approval above 45%, 198 times vs. the RCP average of all polls [including Rasmussen] which has had Obama's approval above 45%, 1 time [and that 1 time it was 45.1%]. Update: June 18, 2014: For those new to these updates, I ask if you will please scroll down to my original post on Oct. 21, 2013 to understand what I am trying to show with this post, that since Scott Rasmussen left the Rasmussen Reports polling firm there has been, not just a bias in their polls, but comparing their poll numbers to everyone else in Real Clear Politics [the gold standard of polls] an almost certain bogus nature to their polling results. For example, let's look at these Obama's approval numbers in the month of June from the polls listed in RCP and see if one stands out [I will give you a hint by highlighting :-)]: 40 - 40 - 38 - 43 - 42 - 41 - 41 - 48 Respectively, these are numbers listed currently in RCP of Fox News - Reuters/Ispos - Bloomberg - Economist - Gallup - NBC/Wall Street Journal - and Rasmussen. Since Oct. 21, 2013 [240 days ago] when I started this Rasmussen watch, I can also update these numbers: Rasmussen has had Obama's approval at or above 50% = 38 times. RCP = 0 times. Rasmussen has had Obama's approval above 45% = 194 times vs. RCP average = 1 time [and the only reason it was one time 45.1% on Oct. 24, 2013 was because Rasmussen put it above-without Rasmussen included in the average, it would have also been 0 times]. Update: June 5, 2014: I am sorry to have a third straight day of updates, but the Rasmussen [less] strange poll numbers are getting more ridiculous, even by their standards. I try to do an update about once every two or three weeks, but this polling firm is getting out of hand. With all that is going on in the world and economically in America and with recent scandals that have plagued this president, what would you think of someone who tried to tell you that Barack Obama's approval rating as president is higher now than even when he got re-elected in 2012? Yes, I would think the same thing: "Who let them out?" Well, that is what the Rasmussen Reports poll is conveying as somehow, their polling is showing the president's approval rating at 52% and disapproval at 46%, a +6% spread. President Obama won re-election over Mitt Romney by a 51-48% margin. And the Rasmussen numbers almost matches what the president won election by in 2008 as Obama beat McCain by 53-46%. Does anyone, even the most ardent liberal Democrat [not counting the Rasmussen Reports people] really believe that Obama is back up or even close to those numbers? This now means that since I have started this Rasmussen watch back in October 21, 2013, 227 days ago, Rasmussen Reports has had president Obama's approval at or above 50%, 36 times vs 0 times for RCP. And the Rasmussen Reports has had Obama's approval above 45%, 181 times vs 1 time for RCP. Rasmussen Reports an outlier? No, much more than an outlier. I submit they have established themselves as a totally bogus polling firm since the great Scott Rasmussen left the firm. June 4th update: I'll just give today's Rasmussen Reports numbers with one comment. [then please read the June 3 update from yesterday, and if you haven't yet the original post from Oct. 21, 2013]. Thank you. Comment: Why, oh why, great Real Clear Politics do you continue to list in your job approval numbers of the President such an undisputed, every day outlier poll, and what I and many others believe is an obvious illegitimate poll? Update: June 3, 2014: So, as not to be repetitive on every Rasmussen Reports update, please read the first sentence of the May 27, 2014 update. Well President Obama is going through another uncomfortable period in his presidency with the VA scandal and now his ill advised terrorist exchange and photo op with the pro Taliban dad of the deserter. Well, I guess the president's approval rating is down. And yes it is with CNN, Gallup, CBS News, Associated Press, Reuters, and ABC News/Washington Post with an average negative spread of those 6 polling organizations at - 10.8% ... and then there is the Rasmussen Reports poll. Yes, somehow they are catching a different mood of the country regarding the president's approval vs disapproval rating in their poll. They incredibly once again have the president in positive territory at + 1% = 50% approve and 49% disapprove. So, either Rasmussen is right or every single other poll out there is right. Keeping the tally from October 21, 2013, when I started my Rasmussen Reports Poll watch [since Scott Rasmussen left the polling firm and taken over by God knows who], try to digest the following stats: In the last 225 days, Rasmussen Reports has had Obama's approval rating at or above 50%, 34 times -- RCP at or above 50%, 0 times. In the last 225 days, Rasmussen Reports has had Obama's approval above 45% an astounding 179 times -- RCP [even including Rasmussen in their list] has had Obama's approval above 45%, 1 time. In case you missed that, let me repeat those numbers....at or above 50%, 34 times vs. 0 times and above 45%, 179 times vs. 1 time. Is the Rasmussen Reports poll bogus? Tales reports, you decide ... the obvious. Note: I think you know how I stand on whether I think Rasmussen Reports has become a bogus polling firm since Scott Rasmussen left as I like to call it the "Rasmussenless Reports". But on twitter from twitter friend Dillon @000Dillon000 has come up with an even more appropriate name for the new Rasmussen [minus Scott Rasmussen] Reports - the "Obamamussen Reports". Update: May 27, 2014: This is ground hog day all over again as far as the record breaking outlier status [to the upside of the president's approval status] of the Rasmussen Reports Poll [since the great Scott Rasmussen left the firm about 9 months ago]. As I am updating this on Tuesday May 27, 2014, Rasmussen once again is alone in having Obama's approval rating in positive territory: 50% approval - 49% disapproval. This compares, as it usually does, in an outlier status to the RCP compilation of polls average, which has Obama's approval at only 44% and a negative 8.1% [approval vs. disapproval]. Also, since my update of May 14, 2014 I can update the number of times Rasmussen has had Obama's approval at or above 50% since I started my Rasmussen watch on Oct. 21, 2013-218 days ago. Rasmussen Reports has had Obama at or above 50% - 33 times in the last 7 months. RCP - 0 times. Even more stark is to look at how many times Rasmussen vs RCP has had Obama's approval above 45%. The Rasmussen Reports in the last 218 days has had Obama's approval above 45% an incredible 172 times. RCP has had Obama's approval above 45 % - 1 time. 1 as in once! To realize how bogus the Rasmussen Reports Poll of the president's job approval number has become: The liberal Democrats don't even quote it to show how Barack Obama is riding high in approval ratings. When even the Democrats realize how bogus Rasmussen has become, that is something. Update: May 21, 2014: If one looked at the Real Clear Politics average of polls, you might think Obama's approval is in the doldrums with a 44.1 % approval average and a negative 7.5% rating of approval vs disapproval numbers. But if one just looked at the Rasmussen Reports website poll numbers, you would think president Obama is flying high. Yes, once again [check the May 14, 2014 update] the Rasmussen Reports has Obama in positive approval with the American people: 50% approval - 48 % disapproval. If I didn't know better, I would think Rasmussen Reports was trying to break the Guinness Book of World Records in longest length of time in outlier poll status. If you scroll down to my original post on October 21, 2013, you will realize that Rasmussen is now well into its 7th month of outlier status [to the upside] regarding the president's approval numbers. The reason I keep pointing this out is, while it is just one poll, it really skews the RCP average [and always in one way]. For example, today [I am posting this before Gallup numbers have come in] RCP has Obama's approval at 44.1% with a negative 7.5% [approval vs disapproval]. If RCP didn't include the Rasmussen Reports poll, Obama's approval would drop to 43.3% with a negative 8.9% rating. Please also read the May 14, 2014 update and then my original post on October 21, 2013 for some context. In the original post you will find I have noticed this outlier status occurring since Scott Rasmussen left the polling firm to start a new digital media organization. The reason I bring that up is some don't know that Scott Rasmussen is no longer with the Rasmussen Reports Poll website [and hasn't been for about 9 months] and they think I am criticizing Scott Rasmussen, which is exactly opposite of what I am doing. Thanks! Update: May 14, 2014: For the third straight day Rasmussen has now had president Obama's approval rating at the 50% mark. So, I decided to do a study from the day I started this Rasmussen watch Oct. 21, 2013, until today, May 14, 2014 [205 days] to see how many times Rasmussen has had the president's approval at or above 50% and how many times the gold standard of polls, Real Clear Politics has had the president's approval at or above 50%. Rasmussen has had Obama's approval at or above 50%, since Oct. 21, 2013, 29 times. The RCP average of polls has had the president's approval at or above 50%, 0 times. Let's put these statistics another way. In the last 7 months [Oct. 21, 2013-May 14, 2014] the RCP average of all polls has had president Obama's approval rating between 40-45%, 99.6% of the time. In the exact same time period, Rasmussen has had president Obama's approval rating between 46-52% 78% of the time. If those numbers don't prove the bogus nature of the Rasmussen poll regarding presidential approval numbers, nothing will. Which leads to the obvious question: Why does Real Clear Politics continue to include Rasmussen [at least as far as the presidential approval numbers go] in their list of polls? Update: May 7, 2014: Please read, for background information, yesterday's update from May 6, 2014 and scroll down to original post from Oct. 21, 2013 when this Rasmussen poll watch first started. Today the Rasmussen Reports once again has president Obama's approval rating in positive territory, and this bogus polling firm has been the only one that not just today but numerous times the last 6 months has had Obama's approval rating in positive territory. Today Rasmussen: Obama approval 50% Disapproval at 48% = +2%, while the RCP average is at -7.1%. Note: without bogus Rasmussen numbers in the RCP average, Obama's approval/disapproval number would be -8.3%. Update: April 11, 2014: For the third straight day, every poll listed in the great Real Clear Politics average of polls has president Obama's approval rating at between 40 and 43% [every poll out of the eight listed except Rasmussen]. Rasmussen for the third straight day has president Obama's approval at 50% in positive territory +1%. Either every other pollster out there is wrong or Rasmussen is wrong. We report, you decide. I have been doing this Rasmussen watch since October of last year. Rather than repeat every point I have been trying to make for the last 6 months, will you please scroll down to my original post on October 21, 2013. Needless to say I consider Rasmussen [at least in regards to the presidential approval numbers] to be a total joke. But, what do I know. Update: April 3, 2014: I received in my e-mail yesterday a well written statement from a Scott Brown that was sent to the Rasmussen Reports about an explanation they gave for questions they received about their polling. If you check my post from Feb. 24, 2014 near the bottom, I echoed those exact same concerns about their meaningless explanation [that did not deal at all with their constant outlier status - an outlier status from the other polls that is always showing a higher number in president Obama's approval than the other polls. There is not one instance [not one instance] in the last 6 months where they have been an outlier having a lower number for president Obama then the other polls. For that to happen for six months seems an improbable statistic for a legitimate polling organization. Plus this phenomena has only occurred after Scott Rasmussen left the organization to form a new company. Coincidence...not over 6 months worth, no way. "Good try today in your polling explanation. No cigar though. Not even close. Your polling is not being criticized for its daily fluctuations, but for being 5-10 points off on a daily basis in favor of the Democrats and Obama." Update: Feb.24, 2014: I first did this post, "What is going on with the Rasmussen Reports Poll" on October 21, 2013. I did not start this post after only one or two odd results. I had been watching it for more than a month of odd results that I had seen. My first post never questioned the legitimacy of their poll [after Scott Rasmussen left the organization] but it was an actual honest elicitation of information of why were we seeing an outlier status in approval of the president's ratings from Rasmussen in relation to the other polls in Real Clear Politics [that was not there when Scott Rasmussen was president of the company]. So, now as we are closing in on a half a year of outlandish outlier status [with one short 3 day period that I noted in my Feb. 13 update, that was within the norm of the RCP average] I now consider the Rasmussen Reports Poll to be totally bogus, with a liberal agenda to advance. Today, Feb. 14, while the RCP average [even including Rasmussen] has the president at -7.5%, Rasmussen has the president's approval rating almost back to his re-election number at 52% and a +5% rating [just about what he won the election by]. I think Rasmussen Reports have given themselves away with their explanation on their site: "Some readers wonder how we come up with our job approval ratings for the president since they often don’t show as dramatic a change as some other pollsters do. It depends on how you ask the question and whom you ask". No, Rasmussen Reports, that is not what the people are wondering. We are not wondering why your ratings are constant. The question the people are wondering is why they are consistently such an outlier result with every other pollster out there, and consistently between 7-14% higher president's approval rating then from the RCP average of polls. Then Rasmussen gave the reason that there poll is different from the other polls is because it depends on who you ask the questions to and how you ask the questions. Well, now we know. Thank you Rasmussen as you have just admitted you are asking the people you want, and the questions you want, to elicit the bogus poll numbers you want. That has to be the only credible explanation of their questionable poll results always favoring the president over the other polls. To me there is no longer a question in my mind of the legitimacy [or I should say illegitimacy] of the Rasmussen Reports poll. The only question that remains is why the greatly respected web site Real Clear Politics [that I love and check every day] is still carrying their poll that skews their average by as much as 3% points. Update: Feb. 14, 2014: Everything you see I wrote in the update of Feb. 13, yesterday, disregard that. I take back everything I said, even more so, after seeing what has to be to a legitimate pollster statistically impossible, absent some major event occurring. For three straight days the Rasmussen Reports poll had Obama's approval at 44% and disapproval at 55%. That meant for three straight days [and the only three days] in the last 5 months that they weren't an outlier poll. So, I foolishly was willing to give them the benefit of the doubt thinking three days might wipe out so many months of outlier status [not just outlier-but huge outlier status]. Well, today in one day the president's approval in the Rasmussen Poll jumped 5 points to 49% with the disapproval dropping 5 points to 50%. From a -11% to a -1% IN ONE DAY with no major event happening or major speech or major positive news on the economic front in the United States or the world and Rasmussen has Obama gaining 10 points in the negativity rating. To me, that even amplifies the bogus methodology Rasmussen has to be using and puts them clearly in the Zogby bogus status from years ago when they were dropped from the Real Clear Politics average. I made a mistake in posting yesterday's positive report on Rasmussen, but I won't be fooled again. Update: Feb. 13, 2014: For almost 6 months this blog has been on a Rasmussen Reports poll watch following the amazing turn of Rasmussen being a respected poll, when Scott Rasmussen headed the organization, into an outlier of almost biblical proportions in which the president's poll numbers were elevated by 7-10 points daily from every other poll that was out there and certainly elevated that much from the highly respected daily RCP average of polls. You could tell how much Rasmussen had fallen in respectability, when not even the liberal Democrats were quoting this poll that had the president near are above 50% while the other polls were showing him near or under 40%. So, it must be noted, today for the third straight day the Rasmussen Reports poll has been back in with the mainstream of all the other polls [with the president's approval rating at 44% positive and 55% negative]. While three days does not wipe out 6 months of outlier status, it does give me hope that Rasmussen can now once again be in the respected poll status. It is hard to understand how this has happened, if they had changed their method that was used when Scott Rasmussen was there and are now changing back because of their outlier status, but something has happened these last 3 days with their polling that didn't show up for many months. Whatever has happened it is a positive development. Update on January 16, 2014: It gets worse and worse and worse. Today, Thursday January 16, while every other polling firm has Obama way down in popularity, near or below the 40% approval rating, Rasmussen Reports has Obama at 51% approval and 47% disapproval. Gallup, during the exact same time frame has Obama's approval at 39%. Even more mind boggling to me than the obvious bogus nature of the new Rasmussen Reports [since Scott Rasmussen left the organization] is why the greatly respected [and one of my favorite web sites] Real Clear Politics continues to carry them in their list of polls, which skews the numbers. If Rasmussen Reports came out tomorrow with Obama at an 80% approval rating would RCP put that in their numbers?? Update on January 7, 2014: I made a statement on my original post on October 21, 2013 that I was not accusing the Rasmussen Reports of being taken over by some left wing Democrats. I'd like to now amend that statement. Unless shown otherwise, I must assume that some liberal Democrats were the ones who took over the Rasmussen Reports web site from Scott Rasmussen when he left to to found a new group. Not only has the outlier status of Rasmussen in favoring the president in his approval rate continued for months, it has now become a joke to even call this an outlier poll. I think bogus would be a better word for it. In today's RCP average of all the polls [including the Rasmussen] the extreme outlier position of Rasmussen is magnified. Even with the inclusion of the Rasmussen Poll skewing the results, there is a spread of approval rating for the president of a negative 11.1% with Obama's approval rating of 42.5%. The Rasmussen joke, errrr poll, has president Obama's approval rating at 49% with a tie in the spread. You're kidding me. And if you check out the latest 7 polls, excluding Rasmussen from the RCP averages, the difference between all those 7 other polls and Rasmussen becomes even more stark. Those show Obama with a 41.4% Approval with a 55.4% disapproval for a negative 14.0% spread, compared to Rasmussen having it even. You've heard the song "more than a woman" from the Bee Gees. There should be a song about the Rasmussen polls, "More than an outlier." In July 2013, Scott Rasmussen left his post to found Rasmussen Media Group, LLC, a digital media firm whose stated mission is to "refine, enlarge, and empower the voice of mainstream America." As you see in the average of all the polls, the president has a 43.7% approval rating with a negative 7.5% spread [i.e., approval vs disapproval]. But the Rasmussen Reports poll showed the president with a 50% approval rating and a tie in the spread. That is a big outlier in favor of the president and it has been like this for weeks now. I am not accusing the Rasmussen Reports of being taken over by some liberal Democrats trying to skew the results in favor of the president, but I am really curious as to why, since Scott Rasmussen has left the Rasmussen Reports, the polls seem to have been an outlier in favor of the president, when in the past, if they were an outlier, they were an outlier that seemed to disfavor the president. Maybe, it is possible, that this is just a coincidence, but it still seems like a curious coincidence to me. I wish someone with a lot more expertise in polls and methodology than me, like Nate Silver or someone like him, would do a comparative analysis of the Rasmussen Reports between the time of Scott Rasmussen's tenure to the time he has left the Rasmussen Reports. Hmm, now that the Rasmussen Reports polls seem more favorable to the president, I wonder if Nate Silver would still label them as biased and inaccurate? I have a vague recollection that one of the polling firms made an effort to assign and reduce the "undecided" part of the poll. I'm thinking that was Rasmussen. Their poll above has no undecided. What is puzzling is all the undecided, and maybe a bit more, went to the president. Good point DBS! and not just this poll, but it has been like this for weeks on Rasmussen. Obama just broke even at 49-49. There is no deficit in his approval ratings now (according to R). Someone needs to clean this **** up. That's the point...Rasmussen has him even compared to every single other poll that has Obama's approval rating at a negative double figure rating. Rasmussen has shown itself to be bogus. So glad someone out there is pointing this out. As of today, they have Obama at 51-47 (Approval +4) !? Is this a joke? Every other poll (on RCP) is well into negative double digits... Even gallup has him back down to 39% for a -14 average today. I know... I keep repeating this post in hopes that maybe Real Clear Politics will find them to be such an outlier that they will take them out of the list. If it was just one time or one week or even one month of outlier polls that would be one thing...this far outlier position has been going on too long to dismiss as just a fluke. Thanks! That's what I was thinking too. I bet Scott is kind of upset as while he is not there it's still his name that could be taking a hit. Thanks Learned Counsel. thanks for that. I was wondering this and it was bothering me. I wish there was some way to tell Ras Rep that I will no longer be looking daily at their stuff. This polling source has become a laughing stock. A 10 point swing in ONE DAY is a complete lie and a complete joke. Who is doing the polling over there. Yep,, that is the big question...it was a good polling firm when Scott Rassmussen headed it but he turned it over to someone....it looks like some liberal Democrats is the only thing I can think of. Like you,I am a conservative Jew although I live and love life in the mountains in NC. Today, Rasmussen is back to 51/47 in Obama's approval/ disapproval rating. The Company either is incompetent(does not look at the RCP averages) or indifferent(does not care). Since Scott departed,it has no spokesman and simply dumps data daily on the public without explanation. How does the Company generate revenue? Conservative subscriptions have dried up so the Company must be desperate to get liberal subscriptions or some of the Public Policy Polling business. I have contacted the Company(info@rasmussenreports.com) to get it to explain itself. I have been ignored. I also have contacted John McIntyre at Real Clear Politics(info@realclearpolitics.com) to ask RCP to delist Rasmussen. You and the other posters may want to do the same. Both conservative and liberal bloggers i.e. Greg Sargent at the Washington Post find Rasmussen's polling to be clownish. Do you remember when it showed Terry McCauliffe ahead by 17 pts. in the Virginia Governor's race? I suspect that Rasmussen Reports will soon go belly-up in the same vein as Strategic Visions and Research 2000. It deserves to. Remember the old expression-- "when wrong ,either change or die". It seems that Rasmussen has decided to expire. I agree with you... I keep tweeting to @TomBevanRCP and @RCP_Articles asking them why are they continuing to publish such an outlier that skews their poll average. It is a complete joke. Thanks about that email address, I will do the same. Blessings to you! Do you have any idea why RCP does not use polling data from TIPP/IBD, ARG or national PPP? One last footnote tonight about Rasmussen. On the Saturday before the 2010 mid-term elections, Ras had Obama's approval/ disapproval at 50/49. Of course, the GOP went on to win 63 House and 7 Senate seats a few days later. For the second day in a row,Rasmussen has Obama's approval/ disapproval at 51/47. I thought Obama's approval would go down due to a big Obama day sliding off. Not with Rasmussen! Also, for the first time since last August 28th, Obama's strong disapproval is 36%. I think it is obvious that Rasmussen is picking up Dems. describing themselves as Republicans and Independents or worse, just fabricating data. Ras has Obama's approval at 52% today--the highest since the government shutdown. I predict that Ras' Congressional Generic Ballot for the past week, which will be released later today, will show Democrats +8. The question is no longer what is up with the Rasmussen Reports as they have obviously been taken over by liberal Democrats with an agenda to promote rather than a legitimate polling firm to uphold, but why is the great site Real Clear Politics continuing to list them after a half a year of outlier status. I agree that Real Clear Politics is remiss in allowing the Ras daily polling to continue while not showing TIPP, ARG or PPP(national). By the way, maybe we should have a prediction contest on when Ras' Obama approval rating reaches 55%. I will go first and say March 3rd. This is how ridiculous Ras' 52/47 approval/disapproval number is.The below paragraph is from today's Ras update. If it were to be believed,18% of Republicans approve of Obama's job approval while only 14% of Dems. disapprove. Say what? RIDICULOUS!! "Eighty-five percent (85%) of Democrats approve of the job the president is doing. Eighty-one percent (81%) of Republicans and 55% of voters not affiliated with either major party disapprove." Maybe I am misconstruing your update above, but please do not shut down the Rasmussen comment site. As a fellow member of the Tribe, venting is therapeutic . And by the by, Ras just released a West Virginia Senate Poll showing Capito(R) ahead by 14 pts. Ras is synonomous with bipolar polling! No, I am not discontinuing the comment section...I just meant that it is fruitless for me to keep posting updates as my original question of the post What is Happening..." has been answered in my mind. They have now been established as an illegitimate bogus poll. I thought I was the only person scratching my head about the RCP Presidential Approval average compared to Rasmussen's numbers. There should be a lot more buzz about what is happening - because they got the 2012 elections so wrong they made tweaks to their polling, now its so inaccurate you would think its a Media Matters poll. The damage is done, their brand is ruined. I agree totally Matt. That's why I keep tweeting to @RCP_Articles and ask them why are they continuing to keep Rasmussen on their list. Maybe one day we will get through as Razz is so bogus. Thanks Matt! Hey, I just heard via e-mail from John McIntyre at Real Clear Politics.McIntyre founded RCP and when I lived in So. CA ,Hugh Hewitt would have Mc on his show weekly. I would forward the correspondence to you,but I am not sure how to do it to this site.Please advise and send your Ras e-mails to Mc at RCP. For two(2) weeks, Rasmussen(less) had Obama's approval in the mid-40's and it stayed there. On Thursday, his approval was at 45%. Today,Saturday, it is 49% and climbing. ( Gallup is at 40%). The Company continues to beclown itself. By the by, I see where Jim Gerralty(?) at National Review Online re-tweets your comments on the Company's Twitter Board. Congratulations. Thanks... yes, I have been watching Rasmussen every day -- noticing there outlier status for 6 months now...and it is always an outlier one way from all the other polls...I think that makes Rasmussen statistical kooks. What's really interesting to me, is that Gallup changed their method in October 2012 to supposedly oversample neglected groups. Of course this swung all to Obama's side. But now, Rasmussen is way more Obama leaning than even the Obama-modified Gallup. The only possible explanation that would save their objectivity, is some peculiar tendency of likely voters to be nearly split on Obama. There aren't many LV polls, the most recent being the GWU 1/12-1/16 that had Obama at -13, while Rasmussen was at +4 on the same day. However, Rasmussen's "presidential approval rating" for that day was -11... pretty much in line with GWU and the RCP average. I think the approval rating at Rasmussen (it's -14 today) remains fairly solid, but their raw numbers are off for some reason. Good analysis- there raw numbers have been off for more than 6 months all in one direction. Except for a few times that you can count on both hands in 6 months they have been an outlier and always one way with all the other polls out there. That is too long to be a statistical anomaly- their methodology has to be purposely manipulated in my opinion to have such an outlier status all in one direction for 6 months. There are many times when every other poll in RCP had Obama at 40 or below in every other poll and Rassmussen had him at 50%- If that happened just one time- okay a statistical anomaly- but numerous times and every time on the upside for Obama- I'm not buying it. They have an approval gap of +1 today. The nearest polling firm gap to that is 7 points down at least. When will Raz be removed from RCP, as an outlier, like Bloomberg was before it? Is anyone WORKING on this? Scott Rasmussen was blackmailed/bribed to walk away, I know it. He's probably nothing but a coward, or a corporatist shill. That's what I've been asking in this post -- I don't understand how RCP can keep them in their list of polls. They have been a big outlier now for 6 months. I keep tweeting this post to @RCP_Articles and @TomBevanRCP asking them why do they continue with Rasmussen. Today, Rasmussen(less) has Obama's approval/disapproval at 50/49. Two(2) days ago,it was 46/53.Their polls are fictions! They are totally bogus-- Now the only question remains is why does RCP keep them in their list of polls. You can not imagine just how a lot time I had spent for this information! Your May 7th post is spot-on and I copied you on the e-mail I sent Rasmussen(less).You are welcome to publish it on your blog. It is amazing to me that any Company showing the incompetence(or fraud) Ras(less) demonstrates on a daily basis can continue in business! Here is a great Nate Cohn/New York Times article blasting Rasmussen(less) for the methodology used in its recent Georgia Governor's and Senate polls. Ras' polling is a disgrace! Just when you think that Rasmussen(less)(D) polling could not get worse, it does. Today,it has Obama's approval/disapproval at 52/47,the best day since late October,2013. I guess that Ras(less) wants us to believe that the American public loves his Administration's scandals. It's unbelievable. These are the same numbers that he won the re-election by. Is there any intelligent person in America who could believe that Obamamussen Reports poll is legitimate? This is a good layout clearly showing how bad the Rasmussen poll has become. I join you in wondering why Real Clear Politics continues to include them in their average when they are consistently so far off that average. Thank you. Yes I hate to be critical of RCP as it is one if my favorite sites- but just in wonderment at the so many months of outlier status- - all in one direction would give RCP pause in continuing to put them in their average and falsely skew the average. Hey guys,complain to John McIntyre at Real Clear Politics at www.info@realclearpolitics.com .I have. A squeaky wheel gets the grease,sometimes. Big Mike---Why not ask Hugh Hewitt to ask McIntyre why he continues to post Rasmussen(less)(D) polls? Better yet, see if Hugh can get someone from Ras(less) on his Show to explain the Company's contrarian polling. Thanks Scott for all the info. I have e-mailed John a while back but will do it again. And that is a good idea about asking Hugh to interview someone from the new Rasmussen [less] site to see how they can explain their polling. On their set up a straw man situation saying people are wondering why are polling is constant compared to the others....no one is aksing that question, people are wondering why you are a consistent outlier- not why you are consistent. I will e-mail Hugh about your suggestion big Scott. That is really interesting, You are an excessively professional blogger. I personally wonder if they are actually polling people or just making it up. And that goes true for when Scott Rasmussen was running the polls. He was clearly favoring the right. They should either audit the polls or dump them. I actually agree with you on that big Dave. This polling firm now is as bad as I've ever seen it for such a sustained length of time. I just don't understand RCP doesn't at least put them on probation to determine their methodology and how they can justify such extreme outlier status. Thanks big Dave- great idea to have a debate site like that. After 4 days with Obama's approval at 45%,in three subsequent days, Rasmussen(less)(D) is back to a 49% approval for Obama. I am amazed that Ras(less) is not embarrassed by its polling and that the Company remains in business. Who would want to be a client of a Company that is wrong/inaccurate on a daily basis. I still believe that Ras(less) is in its death rattle stage! I don't know how these people sleep at night. Like the other person said, they should be embarrassed. Love reading your updates, Mike! I come here when I get frustrated because I know at least there is one other person more bothered by it than me. Lol. Comments about Rasmussen have been silent for awhile.But not anymore. Today,he has Obama's approval/disapproval back to 48/51,whereas Gallup is at 41/53. Also,last week the Company released a poll of the New Mexico Governor's race in which GOP candidate and Governor,Susana Martinez,was tied at 43% with her Democrat opponent. The Albuqurque Journal released a poll of this race over the weekend which showed Martinez +9 over her opponent. Barry goes to 38% (lowest ever on Gallup) and UP to 47% on Ras without the Ras. Time for an update! You are correct Waingro....I noticed that myself...I was very looking closely at today's result because yesterday Gallup went down to 39% and Rasmussen still had Obama at 46%--and usually on Thursday's and Friday's the Rasmussen #s, for whatever reason go down--but today they not only didn't go down but went up to 47%-WHAT? Check back in a couple of hours for an update per yer request! Thanks. Rasmussen(less)(D) has Obama's approval inching up to 48% today,whereas other pollsters have it in the high 30's to low 40's. Even more damning is the one day downward move in the Consumer and Investor Confidences. Nothing short of a one day free fall in the equities' markets would have caused such a drop and the markets were higher yesterday. Yep, I saw that anonymous. Unbelievable...but not really--there is no doubt now they are in the tank for Obama. Sad. Also today, Rasmussen(less)(D) released a NC Senate poll which showed the Dem. candidate doing 5 points better in its poll than in any other recent poll. and today Gallup went back down to 40% approval....it's not credible Rasmussen could have his approval going upto 48% when it is in the low 40's and under in every single other poll. I see now I was wrong for trying to give them the benefit of the doubt thinking they made an adjustment... they are still bogus. Rasmussen(less)(D) approval/disapproval for Obama today is 49/50. This is an outrage.Gallup is at 40/54. Sent an angry e-mail to RCP saying that continuing to use Rasmussen destroys their reliability. Why is this obviously inaccurate "polling" not a bigger issue? Back when Scott was still running it, the numbers did lean more to the right than the RCP average, but not nearly to the degree that they now lean left. Just don't understand how they are getting away with it! Yes, I totally agree with all your points. Thanks! Thanks for the very astute Rasmussen(less) update today.The Company beclowns itself on a daily basis. With a month to go before the mid-terms, Ras(less') State polling is beginning to suffer. When I see a State poll, I add or subtract 4 pts. to make it realistic. Thanks big Scott and thanks being a faithful reader of The Tales!! Rasmussen(less)(D) has Obama at 49/49 today in approval/disapproval. It is three weeks before an election and the Company continues to beclown itself! I doubt that the O Man's approval is 49% in the Dem. strongholds of IL,CA and NY, let alone nationally. Thanks for your efforts and updates in exposing the Rasmussen(less)(D) travesties. Thanks so much big Scott!! Thanks for all your great comments and thanks for supporting the Tales! Yes, it is 3 weeks post-election day and Rasmussen(less)(D) has yet to change its modeling sample. Your analysis of Ras' 2014 mid-term report card was spot-on. Thanks big Scot!!! And Happy Thanksgiving! Some people and Companies never learn from history. Ras' polling is a pure fantasy! Yesm big Scott....sometimes I think only you and I are noticing the bogus nature of the Rasmussen Less poll. Obviously, RCP isn't noticing are they wouldn't continue to keep them in their list of polls. disapproval ratings on 28 days. On thirteen,almost half, of these days, Ras(less) had Obama's approval at 50% or above. According to the Real Clear Politics website, all other pollsters NEVER reached 50% approval during the month except for Gallup on ONE day. Ras(less) has learned nothing from his embarrassments during the 2014 election cycle. Thanks and Happy New Year to you! Yes, it is so maddening--I can only conclude liberal Democrats now run the Ras [less] polling site. Me thinks your Rasmussen(less)(D) probation period is too short. I say give it until June 30th. John William King executed for notorious hate crime murder of James Byrd Jr.
Godless liberals ATTACK Franklin Graham for reminding Buttigieg about what’s IN the Bible!